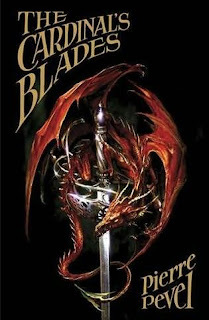 The Cardinal's Blades is the first in a series of books recounting the adventures of the titular military force, set in an alternate-history Europe where humans live alongside the spawn of dragons. Originally published in France in 2007, the novel has been translated into English by Tom Clegg, who seems to have done a good job. This is a swashbuckling novel packed with rooftop chases, back-alley swordfights, epic tavern brawls, clandestine roadside meetings in coaches and cool diplomatic exchanges between men of power where what is left unsaid can be as important as what is voiced. It's somewhere between Dumas and The Seven Samurai with a bit of the Dirty Dozen thrown in as well (and, contrary to some earlier buzz on the book, nothing at all to do with Temeraire; these dragons ain't talking sky ponies). The book is cleverly written. The first third or so of the book sees the introduction of numerous characters, most of whom are pretty shady and disposed to violence. It's clear that this is the 'captain getting his old soldiers back together for a new mission' section, and it's fun working out which characters are the good guys and bad guys (and getting it wrong half the time). In fact, Pevel keeps the reader guessing about that right through the book, as various characters are pulled in different directions and even the apparent heroes' loyalties are sometimes murky. Rapid-fire chapters and changes between location and groups of characters can sometimes be disorienting, but after a while the book finds a rhythm which keeps the pages ticking by nicely as the nature of the conspiracy against France and Spain is made clear and various characters' true loyalties are revealed. The book is rich in historical detail, plunging the reader into 17th Century Paris and its environs quite convincingly, and the fact that sometimes chapters at a time go by with no reference to the draconic storyline can occasionally make you forget that you are reading a fantasy work at all. There aren't that many problems. The book is quite obviously the first in a series and whilst the main storyline is resolved, quite a few character arcs break off in mid-flow, some just as they're getting interesting. The rapid-fire chapters at the start of the book can be a bit confusing and ironically this is one book that would benefit from a dramatis personae, but doesn't have one. Keeping track of who is who can be a problem, as dozens of characters are introduced in a fairly short space of time. However, as the book settles down halfway through, this ceases to be an issue. 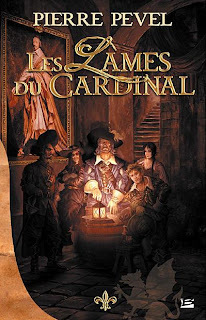 Overall, The Cardinal's Blades (****) is a rollicking good book, full of action, adventure, mystery and some quite delicious intrigue. The book will be available on 19 November in the UK in hardcover and trade paperback, and on import in the USA. A sequel, The Alchemist in the Shadows, follows next year. Interesting, since the book I'm working on is a historical fantasy (set in the Holy Roman Empire 40 years before) I may have to take a peek at this.